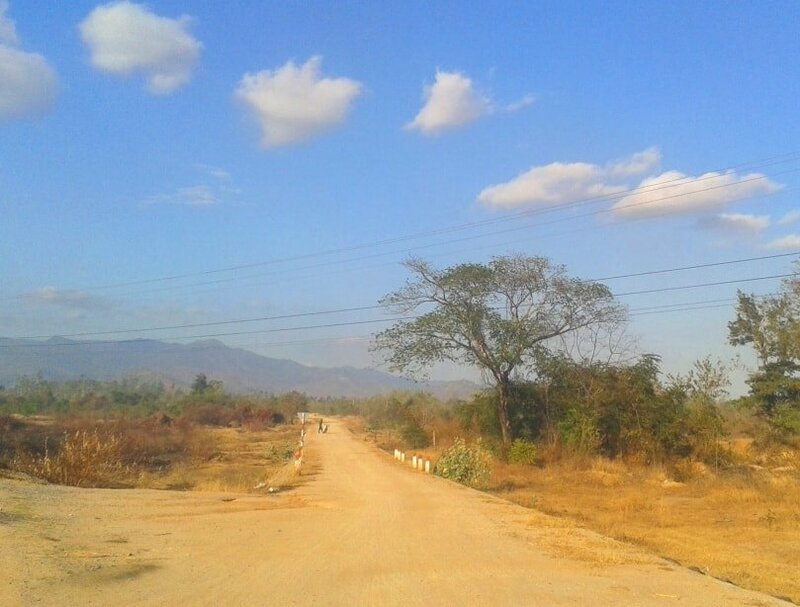 The Burnt Road is a well-maintained but rarely used highway that arcs inland from Cam Ranh Bay to the foot of the Ngoan Muc Pass. This is the burning heart of Ninh Thuan, Vietnam’s driest province. Once an important centre of the Kingdom of Champa, today it’s the poorest and least industrialized province in southern Vietnam. 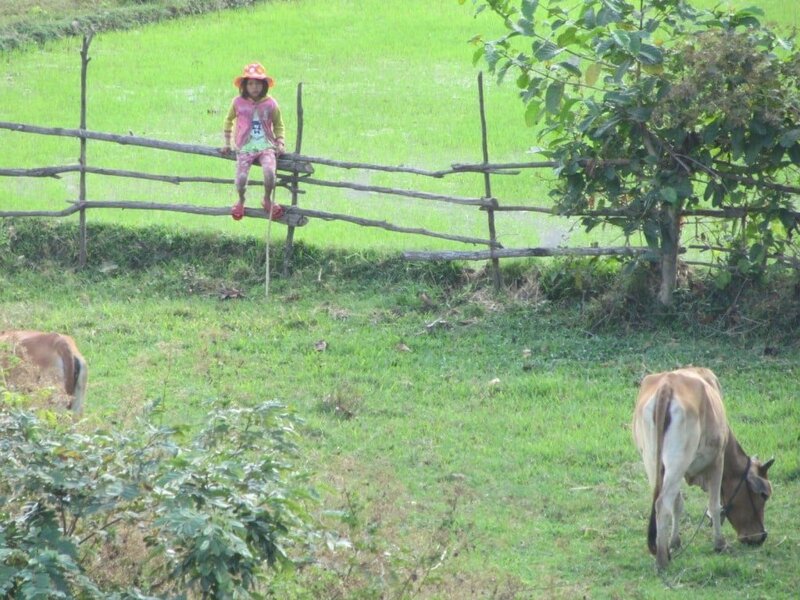 Although Ninh Thuan’s coast offers superb beaches, inland it’s characterized by barren hillsides, abandoned concrete farmhouses, wandering cattle, rusting tractors, dilapidated wooden pens, and vast open spaces. For reasons that I find hard to explain, I have a deep affection for this dry, desolate, rainless area: it thrills me. The Burnt Road is a short and easy ride through a big, hot landscape with swimmable rivers. This road is part of the Ninh Thuan Loop, linking perfectly with the Nui Chua Coast Road to the east, or you can extend the Burnt Road to create an inland loop by continuing on the Cai Valley River Road. The Burnt Road is Highway 27B. 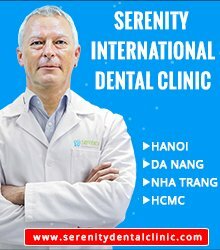 It begins just a few kilometres south of Cam Ranh on the coast, and ends at the intersection with Highway 27 at Tan Sơn, near the foothills of the Central Highlands. As the Burnt Road is only 50km long it’s easy to ride in one day. At Tan Sơn you have several options: turn right (due northwest) to join Highway 27 up to Dalat; or turn left (due southeast) to Phan Rang on the coast, from where you can continue on the Ninh Thuan Loop by taking the spectacular Nui Chua Coast Road all the way back to Cam Ranh; or head directly north from Tan Sơn on the Cai Valley River Road, which will also take you back to Cam Ranh. There are nhà nghỉ (local guesthouses) on the high streets of Cam Ranh, Tan Sơn and Phan Rang. Personally, I like to camp by the river halfway along the Burnt Road (as mentioned in the guide below). 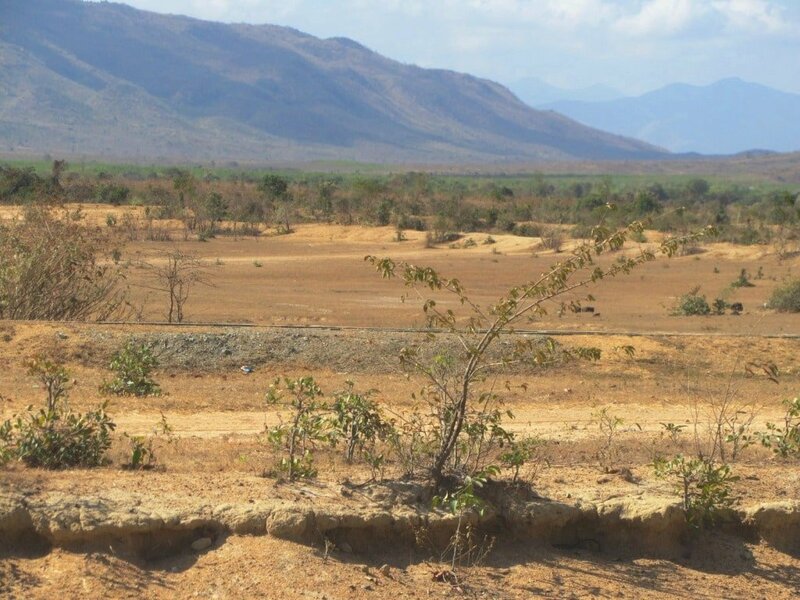 Weather is good year round, but my favourite time is the middle of the dry season (January/February), when the sun bakes the earth, humidity is low, and the nights are cool. Below is my illustrated guide to the Burnt Road and my route map. 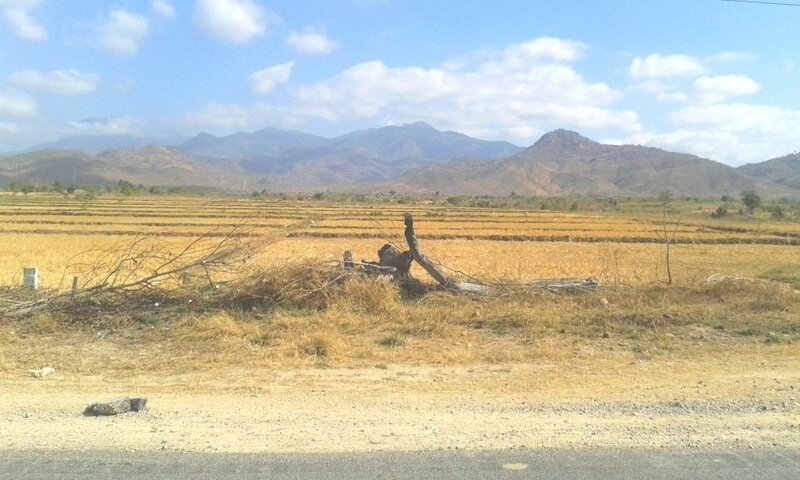 After turning onto Highway 27B the road starts to climb into the arid mountains behind Cam Ranh Bay. The bay glitters a silver-blue under the sun before disappearing behind the ridges. It’s not long before the landscape becomes dry and treeless. 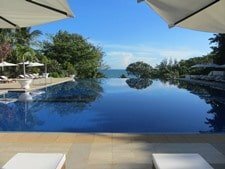 Vietnam is a long, narrow country, but Ninh Thuan Province is at one of its widest points; stretching hundreds of kilometres from the East Sea to the Cambodian border in the west. I call this area the ‘rump’ of Vietnam. 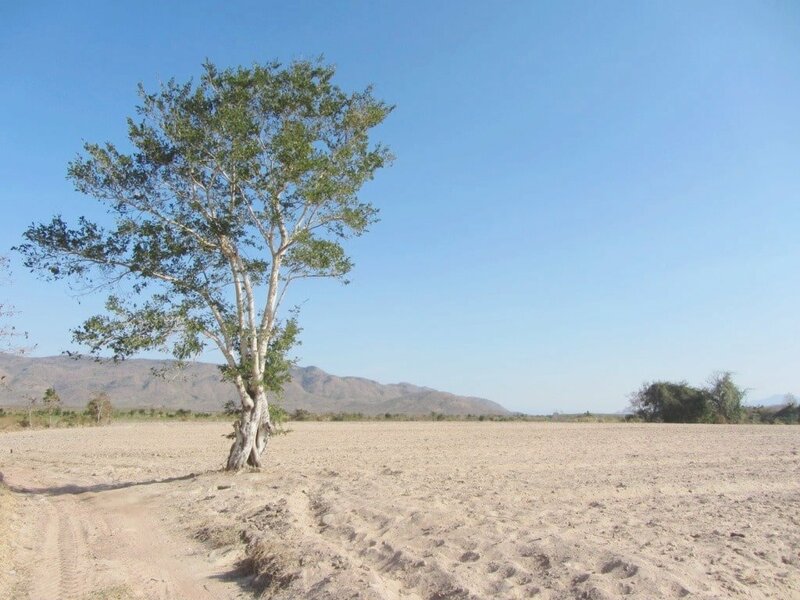 In the sun and heat, this parched landscape feels like a vast basin, its size exaggerated by the massive blue sky of the southern dry season. Once part of Panduranga, an important centre of the Cham Kingdom from the 15th to 19th centuries, the Cham ethnic minority still inhabit this area. 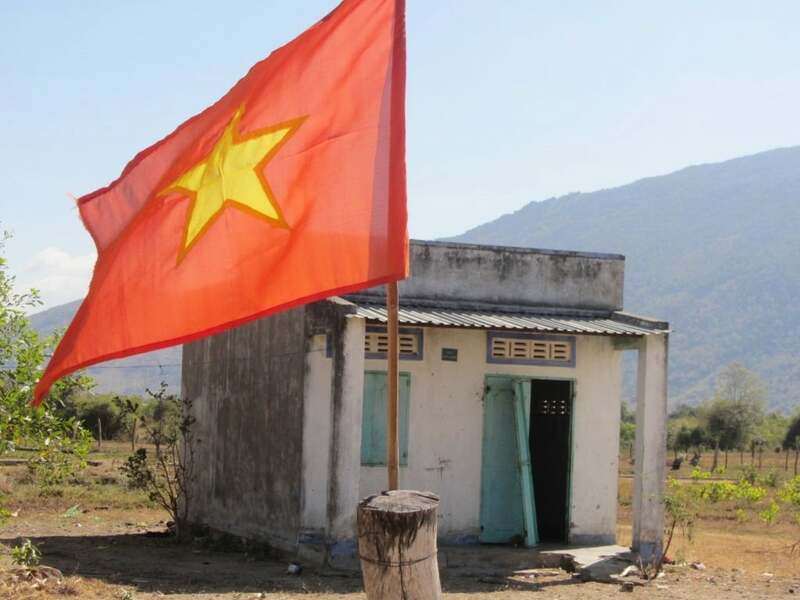 However, the Cham are now among the poorest ethnic groups in Vietnam, and living conditions look bleak and exposed, especially in such a big, hot landscape as this. The faded pastel tones along the Burnt Road remind me of the North American prairies, or southern Spain. This is as close as Vietnam gets to desert. A local couple, who served me a bowl of noodle soup, told me that they had not seen rain for nine months: the nearby reservoir was nearly dry, and the eucalyptus plantations were beginning to suffer forest fires. It sounds inhospitable, but still something draws me to this arid place. The light is clear and sharp, the heat is dry not humid, and the space is open and borderless: there is a sense of wilderness and freedom. Despite rainfall being very rare here, several clear rivers flow through this thirsty region. Fed by rains running off the Central Highlands to the west, these waterways cut a shimmering path across the province. Crops and greenery grow up around the river banks: jackfruit, cashew, peanut, cassava, and mango trees provide some welcome shade. This is also the centre of Vietnam’s wine industry. Labeled as ‘Dalat Wine’, the vines are actually located here in Ninh Thuan Province. 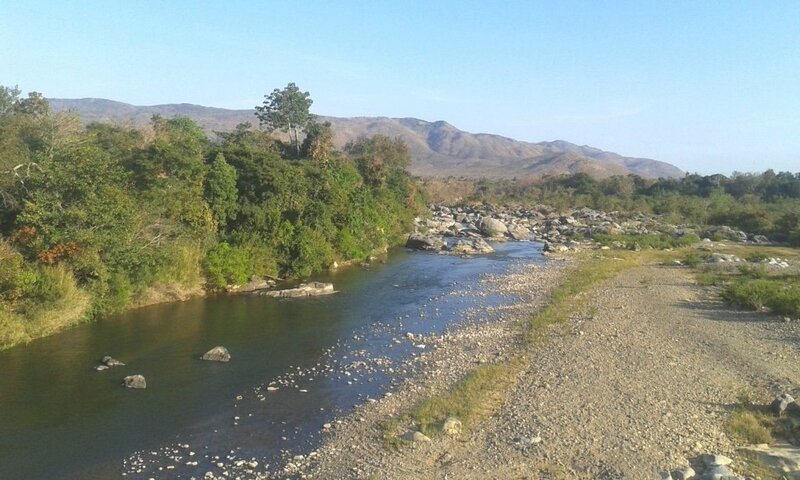 The riverbeds are strewn with smooth boulders from which people cast fishing lines into the water. Look out for paths through the foliage leading down to the riverbanks for a refreshing swim. 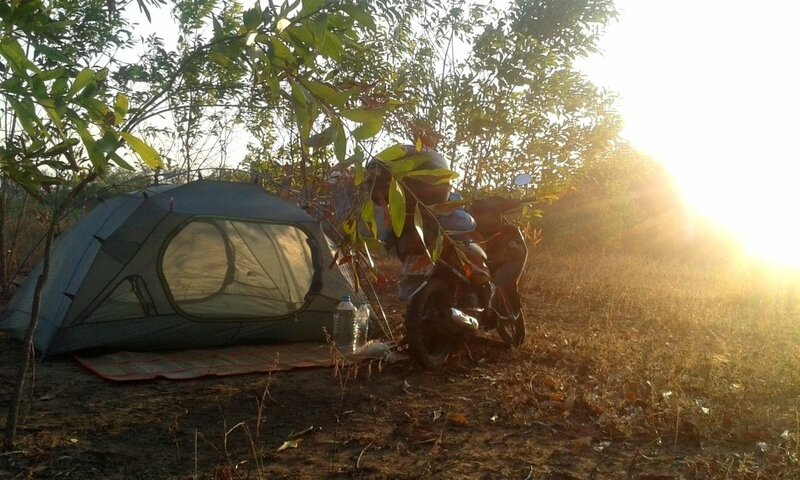 I like to camp here on the cracked earth, in the shade of cashew trees, within sight of the river. 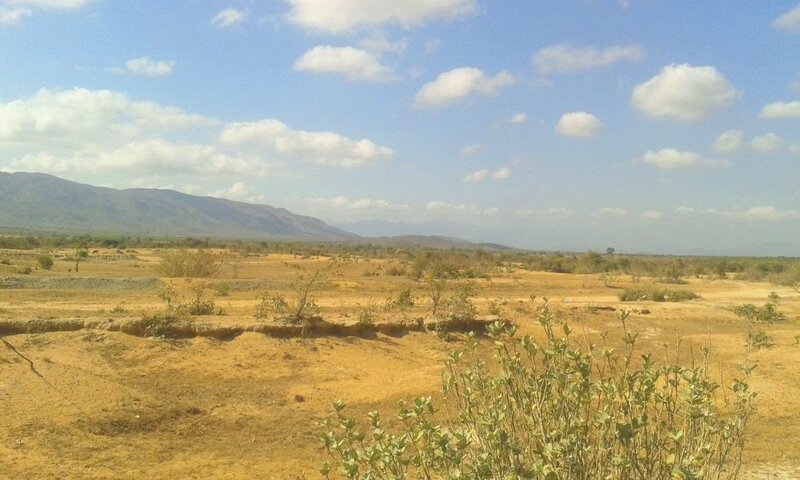 The nights are cool in the dry season, and the area is so sparsely populated that you’re unlikely to be disturbed. Indeed, for the most part there are more animals than people along the Burnt Road. Lumbering cattle wander from pasture to pasture, goats chew at dry grass by the roadside, and ragged-looking sheep – massively overdressed for the climate – collapse in pools of shade. Shepherds and cowherds – mostly young boys and girls – walk lazily with their animals, stopping for an hour at midday for a siesta under a tree. Most people stay in their concrete homes during the day. Late afternoon they come out to fish and bathe in the river. Many homes have been abandoned, left to decay in the sun. There are huge plans to improve agriculture here in the future. 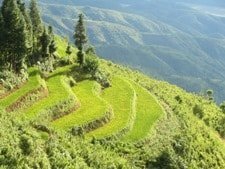 Already, vast eucalyptus forests have been planted, and irrigation channels bring water from the rivers to small fields, where rice and vegetables are grown. But the majority of the landscape remains scorched: each and every eucalyptus leaf burnt to a crisp. 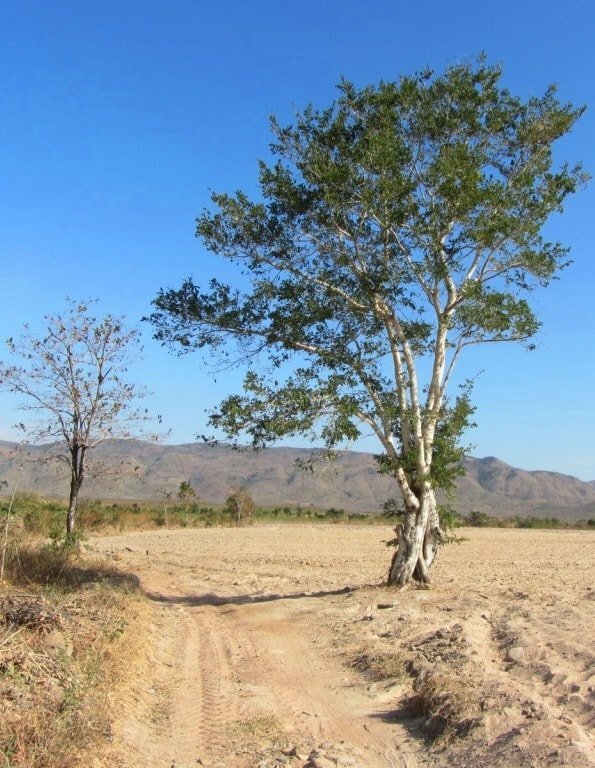 Drive an hour to the west and you’ll be in the pine forests of Dalat; an hour to the east and you’ll be on the white sand beaches of Cam Ranh Bay: but inland Ninh Thuan remains barren and parched, like a mini dust bowl. 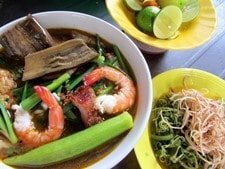 After reaching the junction at Tan Sơn, make a decision about the next leg of your road trip, based on the options laid out in my introduction to this guide. 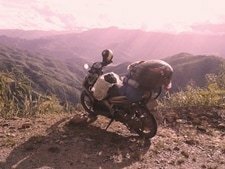 This entry was posted in ALL, Coastal, MOTORBIKE GUIDES, The South and tagged blog, Cam Ranh, desert, guide, motorbike, Ninh Thuan, Phan Rang, road trip, travel, Vietnam. Bookmark the permalink. Today I drove on that road and all around was green and lush. Perhaps it seemed burnt or arid in another time of the year but rice paddies and lots of green (admitted with a bit of tellow) doesn’t make a desert. It’s a lovely road nonetheless. I’ve been using Vietnam Coracle to plan a short two-week bicycle tour around southern Vietnam — and will surely have more questions in the upcoming days, but for now I wonder whether there are any shops (to get lunch, stop for a cold drink, etc) along the way. Yes, you can always find food and drink somewhere, even if it’s just a little shop selling biscuits and soda. 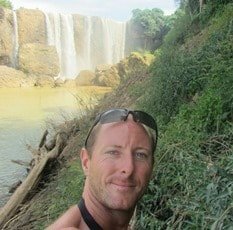 Tom, I really enjoy reading your travel blog! You do get around!!! The Burnt Road area reminds me of the desert areas in California, Arizona and a few other US states. At least there are rivers that wind through the Burnt Road area…California is running out of its water! .More and more agricultural land is left fallow as the drought in this part of the US continues. Thanks for the very interesting and entertaining travel blog. I will continue reading….